Eastern Air Command, Indian Air Force. Applications are invited from eligible Indian Citizens for recruitment against Group 'C' posts in the Stns / Units in HQ Eastern Air Command, Indian Air Force. Age : For all Posts : 18 - 25 years. Upper age limit is relaxation against posts/ vacancies for ST category by 05 years, OBC 03 years and Physically Handicapped for 10 years . (i) 12m passed or equivalent qualification from a recognised Board or University. (ii) 2 years Diploma in Mechinical Drawing or Civil Engineering or Mechinical Engineering or Electrical Engineering or Draughtsmanship (Mechinal or Civil) from an Industrial Training Institute or equivalent any recognized Institute. (iii) Five years experience in D'Manship in a Govt Institute. (i) Matriculate or its equivalent with English as compulsory subject from a recognized Institure. (ii) Profeciency in handling of Private Branch Exchange (PBX) Board from a recognized Institution by the Central Govt. (iii) Desirable: Fluency in spoken English. (g) Applicants should prominently annotate his/ her contact number (mobile or landline) on the application. 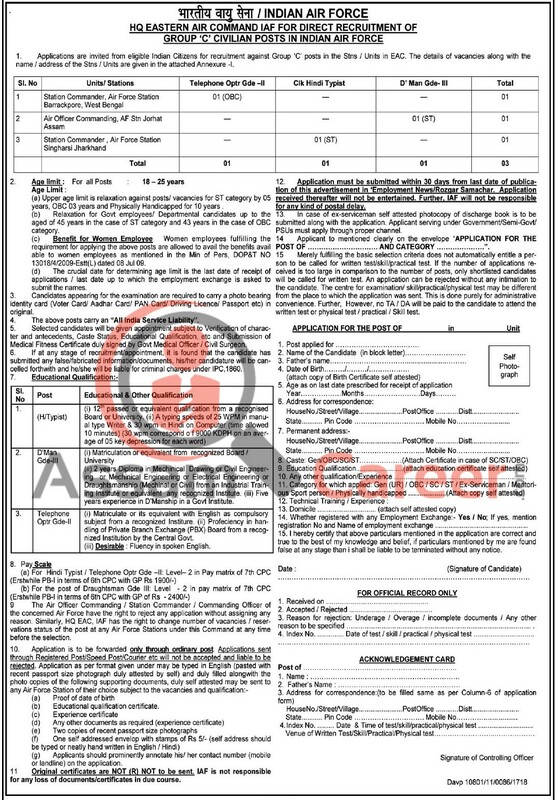 Application must be submitted within 30 days from last date of publication (10-16 FEBRUARY 2018) of this advertisement in 'Employment News/Romer Samachar. Applicant to mentioned clearly on the envelope "APPLICATION FOR THE POST OF________________ AND CATEGORY____________."